"When the San Francisco Giants take the field and everybody stands up to the National Anthem with some Irish tenor's voice piped over the loudspeakers with all the players stuck dead in their places and the white umpires like Irish cops in their black suits and little black caps presses over their hearts standing straight and still like some funeral of a blarney bartender and all facing East as if expecting some Great White Hope or the Founding Fathers to appear on the horizon like 1066 or 1776 or all that"
Of course baseball would intersect with his career in drawings for plays as diverse as Damn Yankees to Fences, and in portriats of Joe DiMaggio, Leo Durocher, and Hank Greenberg. There's even a wonderful tonal drawing of the "Hot Stove League" which features a portrait of Al's father mimicing a batter in the glow of the stove. More than 40 artists from across the country hit it "Out of the Park" at the George Krevsky Gallery's 16th annual Art of Baseball exhibition. Starting with an opening reception on Thursday April 4th, the show continues through Saturday May 25th. A special highlight in this year's exciting lineup is "A Baseball Salon: Memories of The Game," featuring poetry, literature, music, and short films inspired by our great game on Thursday evening, May 2nd, from 6:00 to 9:00 pm. "Baseball is truly a reflection of America's cultural mosaic," says gallery owner George Krevsky, a lifelong baseball fan and veteran art dealer. "In one way or another, we have all experienced the thrill of hitting it Out of the Park. Baseball has touched the lives of all of these creative artists who share their memories of the game with fans, many of whom are visiting an art gallery for the first time. From Little Leaguers to season ticket holders, and the casual viewer, the artwork in this exhibition brings to life our heroes from past and present." With Spring Training well under way in Arizona and Florida, anticipation builds for Art lovers and baseball fans who converge on the 16th annual Art of Baseball exhibition, "Out of the Park" at the George Krevsky Gallery. 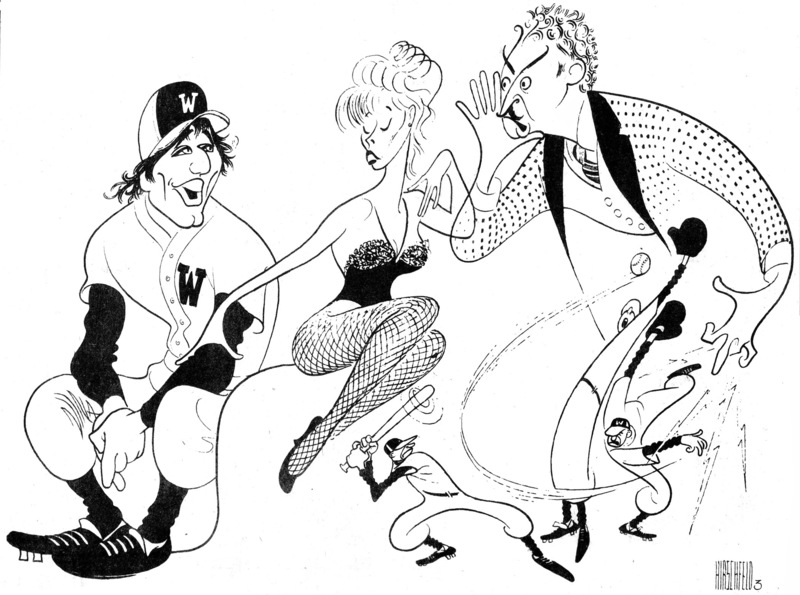 There are two Hirschfeld drawings in the show, both from a revivial of Damn Yankees in 1980 starring Joe Namath. The cast drawing is shown above. There is also an individual portrait of Eddie Bracken as the devilish Appelgate.